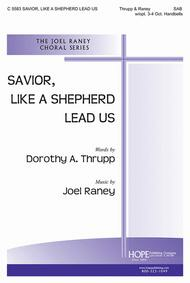 Savior, Like A Shepherd Lead Us composed by Joel Raney. For SAB choir with optional handbells (3-4 octaves). Hymntune, Praise, Prayer, General, Sacred. Octavo. 12 pages. Published by Hope Publishing Company (HP.C5583).Using a new melody with an expressive piano accompaniment, Joel Raney takes the familiar words of this earnest prayer for guidance and creates a highly inspirational setting for SAB choirs. The inclusion of a simple, optional handbell part adds to the beauty of this lyrical setting. Choirs will find this easily learned and deeply moving, as they sing of Jesus, the good shepherd. The reproducible 3-4 octave Handbell Part is included in the anthem. 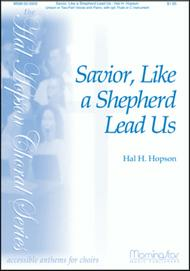 Savior, Like a Shepherd Lead Us composed by Hal H. Hopson. For unison voices or 2-part equal voices or unison treble voices, piano, optional flute or C instrument. Lent, Trust/Guidance. Easy. Octavo. Scripture: Psalms 23. Published by MorningStar Music Publishers (MN.50-5905).With Scripture: Psalms 23. Lent, Trust/Guidance.A beautiful rendition that incorporates the tune BRADBURY. Lyrical unison writing is featured in the first half of the piece, and then a counter melody accompanies the melody for the last stanza. The addition of an obbligato instrument makes this piece sound like it uses many more parts than are needed. A reproducible part for the flute is included in the anthem.